Our shop is offering a great range of books in pristine condition – just like new – ideal Christmas presents. Novels in hardback with immaculate dust jackets selling originally for £15-£25 are now all £3, or two for £5. 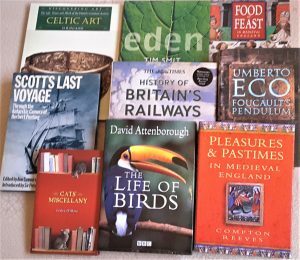 There are also lots of fascinating and beautifully illustrated non-fiction books on a wide range of subjects, in similarly mint condition and at equally bargain prices. Children’s books too. Something for everyone. Located on your route from the Motorpoint Arena Ice Stadium to Nottingham’s Christmas Market, we are open seven days a week in December running up to Christmas – please note Sunday opening is 11am to 3pm.